The Running Back Slip Screen is an explosive play that beats the blitz. This Running Back Screen Pass Play takes practice, but once your players get it down, it will be one of your best plays. The Slip Screen is a play you call when you need a big play. 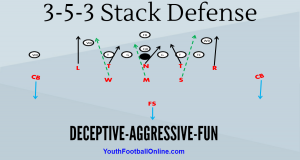 In long down and distances defense will either sit back and play coverage or they will blitz you. This play works very well against both tactics. The throw is the most important aspect of this play. The QB will have some pressure in his face so it’s important to practice this play with pressure during the practice week. Center: Pass block, step into block. Right Guard: Inside-Over pass block, step into block. Right Tackle: Inside-Over pass block, step into block. Left Guard: Chip defensive linemen, let D-linemen rush up-field, pull behind the (LT). When pulling the (LG) must keep his on a swivel to make sure he picks up any interior defender reading the screen. Left Tackle: Chip defensive linemen, let D-linemen rush up-field, pull behind the (TE). When pulling the (LT) must keep his head on a swivel to make sure he picks up any defender sitting or reading the screen pass. Eyes on play-side outside linebacker. Tight-end: Chip defensive end, let him rush up-field, after 2-one thousand, he pulls. It’s important that the TE pulls outside fast and with his eyes the cornerback. If the CB reads the screen or is sitting in the flat the TE must take him. 1 (QB): Catch snap, deep drop back, turn and throw to the 2 back on the screen. It’s critical that your QB gets depth fast and looks off to the right at the same time. This will bring the rush up-field and make the linebackers and secondary flow to the right. The QB needs to be an athlete on this play. He needs to turn, plant his feet and dump the pass over the rushing D-linemen. 2: Show pass blocking, then once the TE releases, the (2) then peels back and outside on his screen path. The RB must be behind the line of scrimmage when he catches the football. Once the (2) catches the football he gets outside and yells go so his pulling linemen know to run downfield and block for him. 3: Run a Post Route right at the middle safety. The (3) must execute a good route, the CB needs to be cleared out. The (3) must put his hand up like he wants the football. 4: Block edge defender or you can have him execute a quick out. SE: Outside release, get vertical, put hand up like he want the football. This will draw coverage and eyes. This is a great way to beat the blitz. QB needs a fast and deep drop back, always looking off to the right. The QB needs to plant his feet and deliver a good throw to the (2). Reps, Reps, and more Reps.
Center and QB snap exchange needs to be good. A bad snap will throw off the timing of the play. Linemen must pull flat across the line of scrimmage. We don’t want them downfield or blocking too early. Pulling linemen need to pull outside with their head on a swivel. If any defender sits on or reads the screen, they must block them.